After watching this I can no longer watch boring pack-breaking videos of folks sitting at their dining room table. This is a must watch. Did I get your attention with that title? Well, your mind is in the gutter. 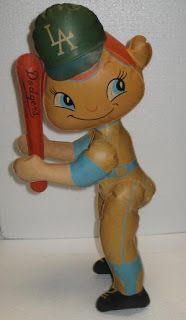 Anyway, recently an unusual Dodger collectible popped up on eBay. Check it out below. 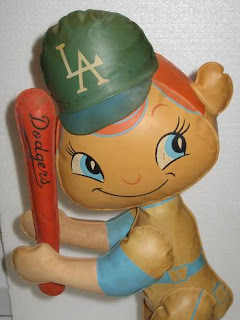 This is a seldom seen early 1960's Dodger blow-up doll. It measures 17" tall and is in decent shape. Unfortunately, there is a slow leak in it, but that did not deter the collecting community. It sold for $48.76. 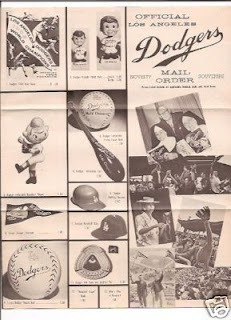 I had originally seen this item in a old Dodger mail order catalog from the period at the Inside the Park Collectibles blog and wondered exactly what it was. (It is the item on the left center below) At first I thought it might be a plush doll, but now I realize it is something very different. But notice, it is a little different than the item pictured below. This doll in the auction is batting while the catalog below shows a pitcher. I wonder how many different versions exist.